The “Gold Dream” PAMP Suisse gold bars are produced in Switzerland to exacting standards to insure that you receive the precise one ounce, 99.99% pure gold you ordered. Produits Artistiques de Métaux Précieux is a gold refinery based at Castel Saint Pietro, in Switzerland. Originally established in 1977, today it is one of the world’s premier gold refiners and a brand recognized worldwide as a guarantee of excellence and sound provenance. The distinctive “Gold Dream” PAMP Suisse trademark is accepted by gold wholesalers and traders worldwide making these gold bars easy to sell in years to come. 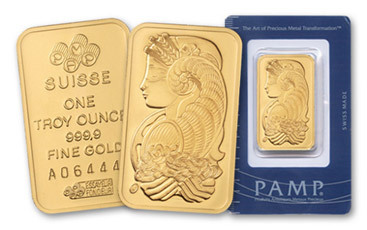 PAMP products are accredited as Good Delivery by the Swiss National Bank and the London Bullion Market Association. Each “Gold Dream” Swiss bar is individually registered, sealed in a protective holder along with its official “Assay Certificate” that guarantees the fineness of 99.99% pure gold and the one troy ounce content.